Based on R.C. Sherriff’s 1928 play of the same name, this 2017 adaptation gives an insight into the experiences of a group of British officers who ate ordered to carry out an impossible raid on the eve of operation Michael, the final German Offensive of The Great War. The play was heavily influenced by the author’s own experiences while serving with the 9th East Surrey Regiment during the same conflict. This adaptation was widely praised on release as a thoughtful, well-acted and meticulously researched piece of work. 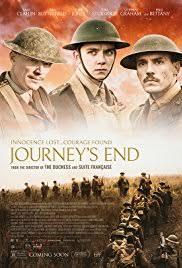 At 7pm, before the film screening, we will have a talk from Clive Harris, a renowned military historian, author and battlefield guide, who will speak about the real-life events that inspired this film – Operation Michael, the last great German Offensive of The Great War and the allied efforts to stem the German advance. There will also be the opportunity for a Q&A session after the talk. We also hope to have inout from Taff Gillingham, whose compnay, Khaki Devil, supplied costumes and equipment and acted as military advisors for the production. We should also have on display, the original plans of Chalrton House when it was in use as a military hospital towards the end of The Great War and we should be able to identify the use ot eht Grand Salon and other parts of Charlton House.